On Sept. 23, as on most days, Aaron Alexis arrived at work at the Washington Navy Yard. He drove up to the front gates, displaying his parking pass and credentials. Sitting next to him was a backpack containing a shotgun and shells. The bag was never searched. He walked into Building 197, having never gone through a metal detector, and started his rampage, killing 12 people. It was a frightening gap in security—a gap not unlike the one that exists at the U.S. Capitol now. Most people, visitors and staffers alike, enter congressional office buildings through side doors, where they are met by Capitol Police and metal detectors. They empty their pockets and their bags are searched. But some House staffers who drive into work don't experience this level of security. To experience this gap, I drove along this week with two senior staffers from a congressional office, who asked not to be named for this story. We approached the House side of Capitol Hill on New Jersey Avenue Southeast. A Capitol Police officer met us at the barricades. He checked the driver's parking sticker and ID and told us to pop the trunk, which contained golf clubs, a box, and two travel bags. He looked in the trunk for less than a second, closed it, and let us in, having never checked the bags or box or asked what was in them. I didn't show him any credentials, nor did he have a metal-detector wand in his hand. We then drove into the Rayburn House Office Building parking garage and found a spot a couple of levels down. We parked and walked right into the building, one staffer carrying a bag. There was no metal detector or major Capitol Police presence. We were now in one of the office buildings where lawmakers and their staff work every day, having gone through practically zero security. As we walked over to the Longworth House Office Building, one staffer told me that this day's arrival was normal. "Driving in is a breeze," he said. "When I first started, I expected high security. But I've always thought that security here, in today's world, is very lackadaisical." The staffer has never taken his concern to the Capitol Police, explaining, "It was something I always thought about it, but never acted on." He has, however, talked to his congressman, who has discussed the lack of security in the parking garages with other members of Congress who share those concerns and want to add metal detectors. The force does what it can with the funds it has. The Capitol Police staff of 1,775 sworn officers and 370 civilian workers conducted 150,000 vehicle sweeps, 27,000 off-site vehicle inspections, and 9.8 million screenings of people in fiscal 2013, according to testimony from Capitol Police Chief Kim Dine. But they have their limits. Some gaps might remain open. When asked specifically about the lack of security in parking garages, Capitol Police spokeswoman Kimberly Schneider said she does not discuss security operations, but said the force "constantly assesses and reassesses our security procedures" and has not ruled out changing them. Further, in response to whether more money would help, she said the Capitol Police "utilizes the funds provided by the Congress to maintain robust security." Any House staffer, spaces allowing, can get a parking pass. Even low-level staff assistants and interns, many of whom have worked on the Hill for only a short time, get passes and come into work through loose security. The sergeant-at-arms did not respond to questions. Hill staffers are generally not perceived as threats to each other or to the general public. But the same might have been said about contractors at military facilities. Most congressional work is done in those office buildings, where members meet, staff work, and committee hearings are held. Securing them is one of Capitol Police's top priorities. There is, though, a security checkpoint going from House office buildings into the Capitol Building, where staffers and visitors must go through metal detectors. One of the solutions here is to add more security checkpoints in the House garages. But that takes manpower and equipment, which requires funding that the Capitol Police says it does not have right now. It also means a longer wait to get into work for those who drive, which is one of the reasons staffers haven't complained about this security gap in the past. 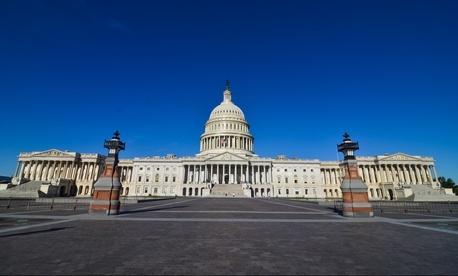 In May, the House passed the Legislative Appropriations Act for fiscal 2015, which sets aside money for staff salaries, architecture projects, and, among other things, the Capitol Police. The police force saw a $9.4 million increase from the last fiscal year, to $348 million. But that increase "does not provide for any new initiatives," according to report from appropriations bill author Tom Cole, an Oklahoma Republican. The bill is pending Senate approval. Capitol Police could shift some personnel from current stations to new ones in the garages. But as sequestration showed, that comes with its own downsides. Police staff was significantly reduced and 13 entrances were shuttered due to reduced, sequester-level funding, which led to longer lines. This is a security concern in its own right, considering the bottleneck of people in open places.